Acer’s new Aspire V 17 Nitro notebooks feature the advanced Intel® RealSense™ 3D camera which will allow users to interact with games, open web pages or navigate applications without even touching the notebook’s keyboard or mouse. These next-gen laptops will also allow users to take full advantage of 3D printing and scanning, since Intel’s RealSense technology is what drives the next-level webcam capable of sensing depth and dimension. “Acer believes three dimensional computing offers unlimited potential for both professional and consumer uses,” said Jerry Kao, President of Acer Notebook Business Group. “Together, they infer depth by detecting infrared light that has bounced back from objects in front of it. This visual data, taken in combination with Intel RealSense motion-tracking software, creates a touch-free interface that responds to hand and head motions as well as facial expressions,” it says in Acer’s press release. “With Intel RealSense technology consumers will be able to control and interact with their computers in a natural and immersive way. 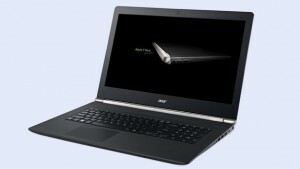 Whether it is controlling a game with your gestures or easily scanning your face or an object for 3D printing, the Acer Aspire V Nitro featuring Intel Core processors and Intel RealSense is an exciting step forward for consumers looking for a high-performance notebook,” said Kirk Skaugen, Senior Vice President, Intel and General Manager, Client Computing Group. The Acer Aspire V 17 Nitro will be available in January. No price has been announced, but it’s pretty likely that it will come in around the $1,499.99 charged for the most recently versions of this model line.